Ending years of negotiations and questions about the team’s future, Chargers chairman Dean Spanos announced Thursday the team will leave San Diego after more than half a century and move north to the Los Angeles area beginning this fall. 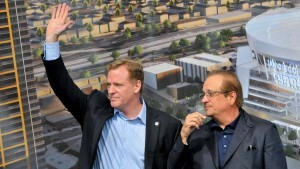 Spanos announced the move in a letter posted on the team’s website. The Chargers will become the second team in the Los Angeles region along with the Rams, and will share a stadium being built for the Rams in Inglewood, a city abutting Los Angeles. While the Inglewood stadium is under construction, the Chargers will play their home games at the roughly 30,000-seat StubHub Center in Carson in Los Angeles County. The stadium is home to the Los Angeles Galaxy of Major League Soccer. Spanos noted the Chargers’ inaugural season in 1960 was played in Los Angeles and while the team has had fans there since, the Chargers have “a tremendous amount of work to do” to earn the respect and support of Los Angeles football fans. The announcement came one day after Spanos was given until Tuesday to decide whether to remain in San Diego or move the team to Los Angeles. The two-day extension was granted by team owners on the stadium and finance committees who met in New York to discuss stadium situations in San Diego and Oakland, home of the Raiders. Political leaders in San Diego disputed Goodell’s claim in a news conference. Mayor Kevin Faulconer said the Chargers rejected every offer, including one made just a few weeks ago. The decision climaxing the Chargers’ long-running search for a new playing facility came two months after the defeat of Measure C, which would have raised hotel room taxes to provide the public portion of the cost of building a downtown stadium. Because of the tax increase, the ballot measure required two-thirds approval to pass, but it failed to even get a simple majority. In a statement, San Diego Padres Executive Chairman Ron Fowler and Managing Partner Peter Seidler said they were “deeply disappointed” by the news. Even though the team will play in a neighboring city, L.A. Mayor Eric Garcetti seemed ecstatic at the news. “Los Angeles is one of the world’s great sports towns. Championship teams and iconic athletes aren’t just memories here — they are legends woven into the fabric of our history. Today, we welcome an important part of that history back with the Chargers returning to Los Angeles,” the mayor said in a statement. The Chargers also unveiled a new logo with a white, italicized LA on a field of dark Dodger blue, with the base of the L in the form a lightning bolt. Goodell expressed sympathy for Charger fans, noting their “strong and loyal support” for the team over the past half-century. “As difficult as the news is for Charger fans, I know Dean Spanos and his family did everything they could to try to find a viable solution in San Diego,” he said.